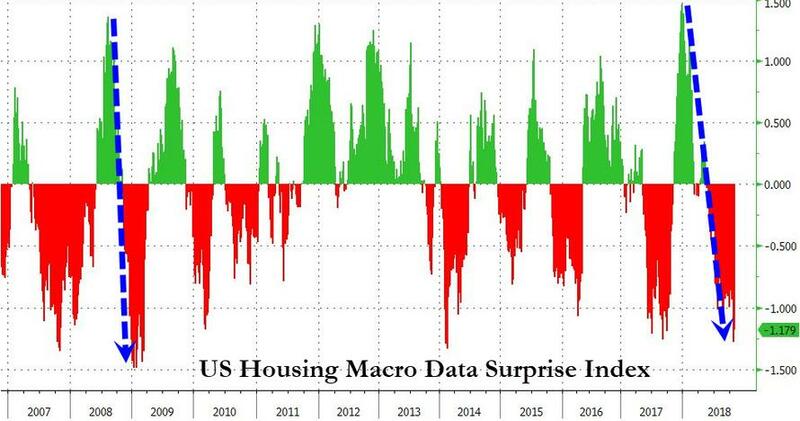 The US housing market is anything but healthy and even most bullish of realtors (especially since "it is difficult to get a man to understand something, when his salary depends upon his not understanding it") is admitting that all is not well. 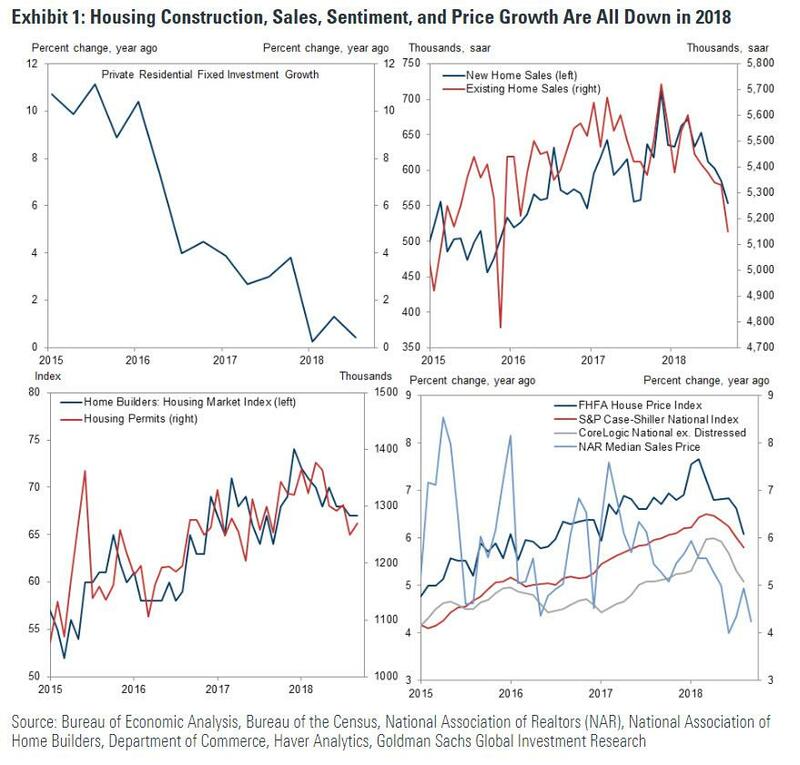 Construction has slowed, sales have dropped, home prices have decelerated, and sentiment in the sector has deteriorated. The sharp underperformance of homebuilder stocks suggests that investors expect the sector to continue to struggle. And, as famed housing-watcher Robert Shiller notes, the weakening housing market is similar to the last market high, just before the subprime housing bubble burst a decade ago. The infamous US housing bubble in the mid-2000s and the subsequent subprime meltdown were key factors spurring the broader financial crisis of 2008. RT reminds us that a speculative frenzy over house prices, mortgages beyond long-term capabilities to finance, and eventually a wave of defaults by borrowers, threatened the solvency of some key financial institutions which in turn led to a stock market crash, and the global financial crisis. The most likely drivers of the slowdown are higher interest rates and tax reform. We estimate that higher interest rates explain roughly two-thirds of the deceleration in residential investment since 2017. Provisions in tax reform that reduced the value of the home mortgage interest deduction have also likely had a modest negative impact on house prices and might have contributed to the slowdown in homebuilding and sales as well. We expect higher interest rates and tax reform to remain headwinds, but see the low level of homebuilding relative to demographic trends as a medium-run tailwind. Our residential investment model accounts for both of these offsetting forces and currently projects a -1.5% growth pace in 2019. 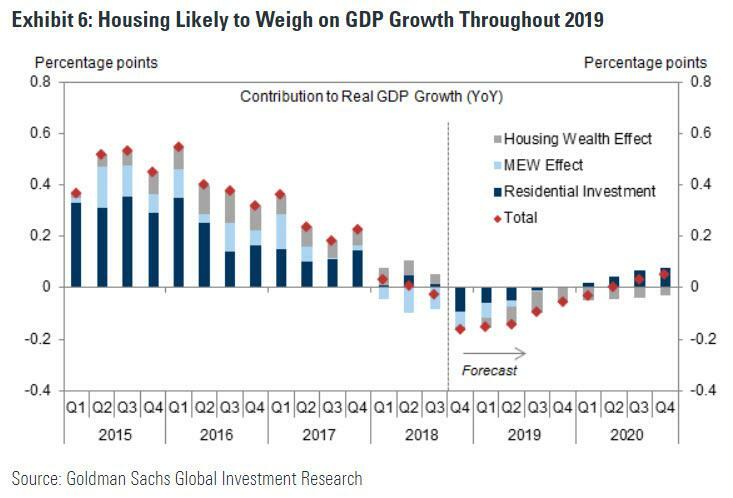 Weaker residential investment coupled with smaller wealth effects on consumption as house price appreciation slows would reduce the total GDP contribution from housing from +0.3pp on average in recent years to -0.2pp in 2018 and -0.1pp in 2019. We do not expect Fed officials to be particularly unnerved by the softer housing data. Housing is by far the most interest rate sensitive sector of the economy and has long been seen as the textbook transmission mechanism of monetary policy. Far from being a surprise, a meaningful slowdown in residential investment is a key feature of a successful tightening cycle. Fed officials are therefore likely to instead remained focused on aggregate activity and continue tightening until overall GDP growth and job creation have slowed to a sustainable pace. To react too strongly to a housing slowdown would risk repeating one of the mistakes of the late 1960s, when the Fed reversed course after initial tightening hit housing hard, contributing to the decision to keep policy too easy for too long.